If you like playing casino games and slots then you are sure to be delighted by the launch of Pocket Casino, a fantastic mobile gambling destination. The casino features mobile games from a number of developers such as Big Time Gaming, ELK Studios and Microgaming. There is a large selection of slots built on a variety of themes and some of the games offer large progressive jackpots. All the standard casino games are on offer as well as a variety of roulette, blackjack and video poker games. Players can also enjoy a number of scratch cards. Of course all the games can be played on both mobile devices and computers. 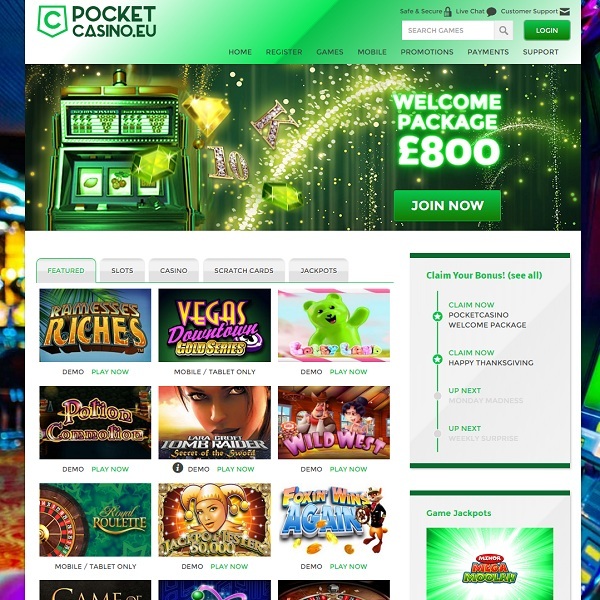 New members of Pocket Casino can enjoy a 100% first deposit bonus of up to £200 followed by a 50% second deposit bonus up to £300 and a 100% third deposit bonus up to £300.